Imagine hearing the unmistakable sound of a baseball meeting the full force of Hall of Famer Al Kaline’s bat at Tiger Stadium. Imagine feeling the thrill as the solid, brass-colored elevator doors slowly opening onto the 12th floor of downtown Hudson’s, revealing aisle upon aisle of your favorite toys. Imagine working on the assembly line at Ford Motor Company when the first Model T rolled off it and, shortly thereafter, drove onto Woodward. You might experience feelings — or memories — like these again at the Allesee Gallery of Culture. This exhibition highlights the culture that all Detroiters recognize as our own — a distinct blend of influences, inspired by creativity and fueled by a passionate work ethic. In the 20th century, Detroit put the world on wheels, armed the world against tyranny in World War II and provided the soundtrack for a generation that came of age in the 1960s. Understanding the community that achieved these things requires an immersion into the culture that surrounded them. 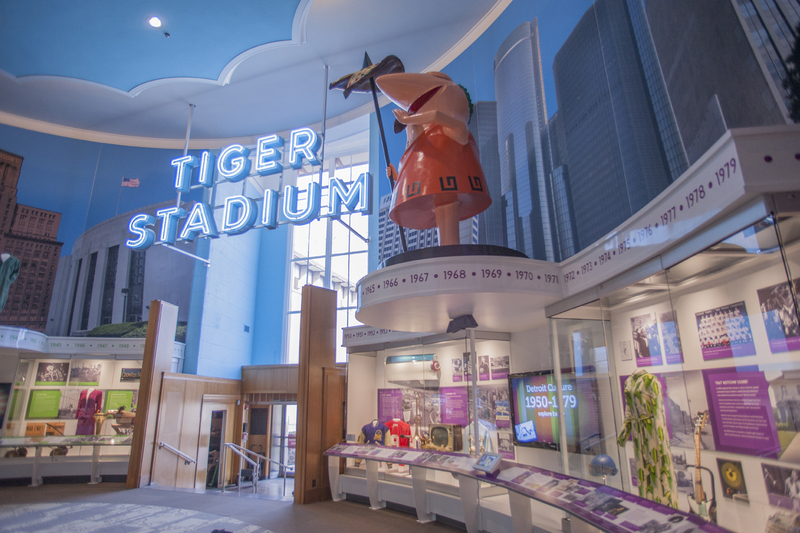 Using the 20th century as a base, visitors learn about Detroit culture through time and share common experiences that define Detroit. Divided into four sections, the exhibition addresses key themes for each decade using objects, images and video. Ready for Greatness: As the 1900s unfolded, Detroit was poised to become one of the nation’s great cities. Asphalt or bricks topped its main roads and electricity and telephone lines served a growing number of homes and businesses. Factories, skyscrapers, hospitals, libraries and museums rose. Parks beckoned people from their new homes. As the automobile evolved from curiosity to commonplace, Detroit pioneered concrete roads and traffic signs to carry cars and direct their drivers. Meanwhile, a reorganized city government took the wheel of the municipal transit system. Driving Detroit’s Economy: With its firm industrial foundation, Detroit naturally became the Motor City. Innovators and entrepreneurs took advantage of an environment that boasted transportation by land and water, capital, infrastructure, natural resources and a skilled workforce. By 1915, more than 125 companies manufactured cars in the Detroit area. Local suppliers built engines, tires and other automobile components. Truck, trailer and camper manufacturing soon followed. Detroit also became a leader in aviation. Boeing, Buhl, Stinson, Ford, Verille, Stout, McDonnell and Loughead were Detroit innovators that excelled in the new aeronautics industry. Building Boom: During the 1920s Detroit’s industry and population boomed, making it the fastest growing city in the country. Many of Detroit’s iconic buildings were constructed during this decade. The Book Building, Book-Cadillac Hotel and Book Tower were completed in 1917, 1924 and 1926, respectively. They were joined in 1928 by the Fisher Building, the Penobscot Building and the Fox Theatre, and in 1929 by the Guardian Building. Transportation routes also improved. The Ambassador Bridge spanned the Detroit River in 1929 and the mile-long Detroit-Windsor Tunnel, which took cars beneath the river, opened a year later. Prohibition! When the United States outlawed the sale and consumption of alcohol in 1920, Detroit became home to a new industry: smuggling. Speedboats transported illegal beer and spirits across the Detroit River from Canadian breweries and distilleries. Nearly 75 percent of all liquor smuggled into the United States from Canada during Prohibition came through Detroit. In southeastern Michigan an estimated 25,000 illegal bars satisfied thirsty customers. Smugglers were creative and vicious, and gangs flourished. For some officials, bribes proved too tempting to ignore. Prohibition’s illicit $200 million smuggling business, second only to the auto industry, made Detroit one of the toughest towns on the continent. A Championship Season: The 1935-1936 season secured Detroit’s reputation the “City of Champions.” Its professional teams swept the field, while amateur athletes from the region topped the leader board in twenty sports nationally and internationally. In professional sports, the Tigers won the 1935 World Series against the Chicago Cubs and the Lions defeated the New York Giants to claim the 1935 NFL championship. The Red Wings obtained their first Stanley Cup in 1936 when they beat the Toronto Maple Leafs in the finals, while boxer Joe Louis earned 27 wins, 23 on knockouts. Great Depression Hits Hard: Detroit’s thriving automobile industry came to a standstill following the economic collapse of 1929. Tens of thousands were put out of work when companies suspended operations or closed. In less than one year, relief rolls grew to include almost half of Detroit’s population. People with jobs had their wages cut by thirty percent and were often paid by “scrip” – promissory notes that served as cash. Those with savings found the doors of banks closed – sometimes permanently. In time the federal government provided relief in the form of monetary support and jobs programs. The Works Progress Administration paid Detroiters to build parks and beautify buildings. Shifting Gears: As conflicts in Europe and Asia escalated into World War II, Detroit factories and shops focused on manufacturing products needed for war. By 1942 Detroit retooled itself into the “Arsenal of Democracy.” The region’s manufacturing industries produced nearly 30% of all military products used during the war, including planes, trucks, tanks, boats, guns and other essential gear. Metro Detroit’s population ballooned by more than 25 percent as workers and their families arrived from around the country for well-paid factory positions. Manufacturing companies constructed new factories around the city and Detroiters built new neighborhoods near them. A Thriving Downtown: War jobs brought prosperity back to Detroit and despite shortages and rationing, shops downtown thrived. Clothing firms, especially those catering to working women, became iconic elements in the Detroit shopping experience. Retailers like Himelhoch Bros. and Kline’s catered almost exclusively to women with a wide selection of upscale fashion clothing and accessories. Other popular downtown stores included Crowley Milner and Company, which by 1946 covered almost 800,000 square feet with 17.5 acres of floor space and 1,450 sales associates, and Henry the Hatter, which still supplies gentlemen with fine and casual headwear today. Style & Muscle: Automotive design came of age in the 1950s. Simple fenders and bumpers gave way to long hoods, integrated and sculptured grills -- and lots of chrome. Large tailfins and futuristic instrument panels reflected aerospace inspiration. Performance became a key selling point. Ever-larger V-8 engines inspired the hot rod and muscle car crazes. Everywhere, it seemed, drag racers dodged the cops. General Motors, led by designer Harley Earl, introduced its sleek, fiberglass-bodied Corvette in 1953. Ford answered with its Thunderbird in 1954, and in 1964 launched its revolutionary Mustang. In 1956, Chrysler, guided by stylist Virgil Exner, unveiled its ‘forward look” Imperial and 300. A Changing City: Inside and outside its city limits, Detroit was growing and changing. Launched by the federal Housing Act of 1949, the modern urban renewal movement began to transform Detroit’s core, replacing old industrial and residential buildings with high-density housing, parks and a modern waterfront Civic Center. Detroit’s Cultural Center and Medical Center neighborhoods expanded. A new freeway system initially connected new suburbanites with their downtown jobs, but over time the flow reversed. The highways stimulated development of shopping and office facilities in suburbs, speeding the decay of Detroit’s central business district. Roots of Unrest: Post-war recession and industrial shifts changed Detroit. In the early 1950s, the east side alone lost more than 70,000 jobs as work moved to plants in other states or companies went out of business. Racial tension escalated as urban renewal and freeway projects destroyed black neighborhoods. Displaced African Americans found themselves unwelcome in newer neighborhoods and whites responded by migrating to the suburbs. Detroit’s black population grew steadily, along with resentment over discrimination in housing, employment and education. The nearly all-white city government resisted change with force. In 1967 heavy-handed police tactics finally sparked a violent reaction. Looting and arson destroyed several neighborhoods and shook the city to its core. That Motown Sound! In 1959 songwriter Berry Gordy, Jr. drew on Detroit’s gospel and rhythm & blues traditions, added some pop influences and created the successful crossover “Motown Sound.” Gordy formed Motown Records, which at its peak had more than 45 subsidiaries that oversaw songwriting, recording, publishing, promotion, management, talent development, booking and distribution. Motown stars included Smokey Robinson and the Miracles, The Marvelettes, Diana Ross and the Supremes, the Four Tops, Stevie Wonder, Marvin Gaye, The Temptations, Martha Reeves and the Vandellas, and Gladys Knight and the Pips. By 1966 Motown companies occupied eight homes on West Grand Boulevard where the Motown Museum is today. Image Problems: A national recession in the early 1980s hit Detroit’s auto industry hard. Public perceptions of the “Big Three” suffered as they laid off workers in attempts to avoid bankruptcy. Chrysler, led by Lee Iacocca, rebounded with innovations in car design, including smaller and more fuel-efficient cars and the debut of the minivan. Meanwhile, Detroit became nationally known as the “Murder Capital” of the U.S., and for its “Devil’s Night” arsons on the eve of Halloween. When the Tigers won the 1984 World Series, the celebration’s destructive turn made national news. However, during the same era, Detroit began hosting Grand Prix auto races, world-class music festivals, the 1980 Republican National Convention and Super Bowl XVI. Good Sports: During the 1980s and 1990s, Detroiters embraced their sports heroes. Outgoing Tiger Al Kaline joined George Kell in the broadcast booth, while baby-faced Steve Yzerman became a beloved Red Wings captain. The Tigers’ 1984 World Series winning roster included Sparky Anderson, Alan Trammell, Kirk Gibson, Lou Whitaker and Chet Lemon. Meanwhile, the Lions’ Billy Sims and Barry Sanders and the Pistons’ Kelly Tripuka were admired for their good sportsmanship. Encore! Detroit's once-vibrant theater district blossomed again, beginning with Orchestra Hall’s rescue from demolition. By 1989 the Detroit Symphony Orchestra again called the restored building home. Born a movie palace in 1928, the Fox Theatre became a prime performance venue after extensive renovations in 1987. A year later, the Michigan Opera Theatre restored the 1922 Capitol Theatre and renamed it the Detroit Opera House. In 1997 the conjoined Century (1903) and Gem (1927) theaters, both fully renovated in 1990, moved five blocks to make way for Comerica Park. The Majestic (1915), Fillmore (1925) and Music Hall (1928) theaters were also revitalized. Support for the Allesee Gallery of Culture was provided by Bob & Maggie Allesee.